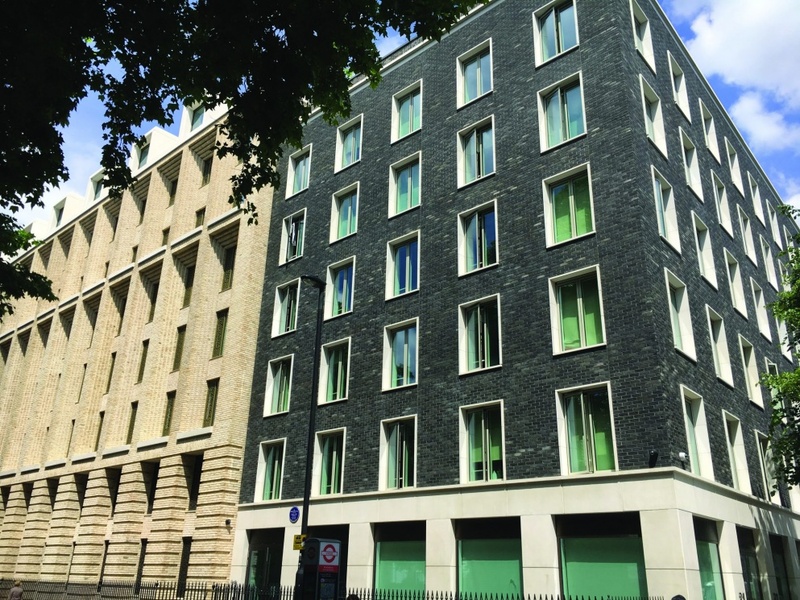 A project to redevelop student halls for the University of London presents an exemplar of attention to detail in cladding, achieving a mix of traditional and modern to blend into its historic built environment. Jack Wooler reports. 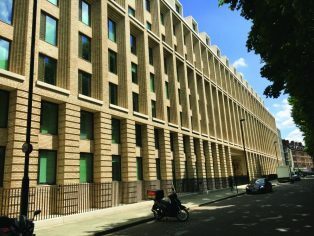 In the heart of the Bloomsbury Conservation Area of King’s Cross in central London, a new £140m redevelopment of affordable student accommodation called ‘Garden Halls’ has been completed, replacing the former 1930s and 1950s buildings. 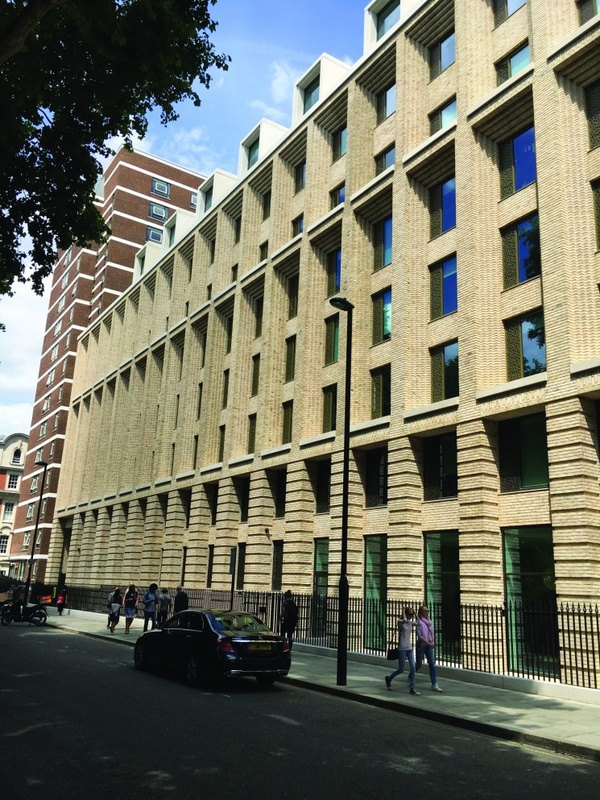 Architects Maccreanor Lavington worked alongside masterplan and executive architects tp bennett to design the principal nine-storey facade facing Cartwright Gardens, along with a lower seven-storey building at the corner of this historic and prestigious site. A reworking of the Canterbury, Commonwealth and Hughes Parry Halls, the new structures were formed using an in situ concrete frame with brick-faced concrete cladding panels on all external elevations, while two new internal courtyards feature a render finish. The private gardens were also redeveloped, and four new tennis courts installed. Built for the University of London in partnership with student accommodation provider University Partnership Programme, the result is one of the largest halls of residence in London, housing 1,200 rooms. The project has already achieved widespread critical acclaim from the architectural fraternity, partly due to the extremely high quality of finish and level of attention to detail. The client said that the accommodation would allows students to live, study and unwind in an “inspirational, safe and secure environment,” supported by pastoral care. Shared kitchens, peer learning space, TV lounges, a games room, music room, dining facilities and a cinema room all create a sense of comfort for students to relax away from home. Hoping to engender a healthy environment outdoors as well as in, bike storage, landscaped gardens, green courtyards and the free use of the four tennis courts are all included for the student residents. The provision of a 24 hour reception, catering and security services provide an extra sense of ease. Garden Halls are also security patrolled, utilising CCTV to keep the building as secure as possible. rooms and five three-bed apartments on offer. Space has been used economically throughout the apartments, providing a high level of style and function in restricted spaces. All the apartments are fully fitted, ready for students to move in with a minimum of hassle. Set in the heart of the capital, the halls benefit from unrivalled travel links, just a short walk from St Pancras International and King’s Cross stations, as well close proximity to a host of local amenities. The area of Bloomsbury is often noted for its formally planned arrangement of streets and leafy squares, boasting some of the best-preserved London squares within its conservation area. Gavin Finnan, associate director at Maccreanor Lavington explains the architects’ approach to what is a historically sensitive site: “The challenge was to design a contemporary nine storey facade along one side of a historic garden square, opposite a crescent of listed four-storey Georgian townhouses. He describes the historic context from a designer’s point of view: “Townhouses arranged in terraces are the predominant building form across the area, with a large majority of residential development from the Stuart, Georgian, Regency and early Victorian periods. Such buildings include the site of the former Foundling Hospital, The British Museum, Great Ormond Street, and the University of London itself. Several of these larger buildings form a significant frontage to some of the squares within the area. In keeping with the area’s rich architectural heritage, Garden Halls’ facades have been meticulously designed to provide a striking counterpoint to the building’s adjacent garden square. Maccreanor Lavington worked as an integral member of the design team, preparing detailed design intent information that was incorporated into the Employer’s Requirements as tender. Following the appointment of Multiplex as the main contractor and Thorp Precast as the specialised sub-contractor, Maccreanor Lavington stayed client side and worked in partnership with executive architect, tp bennett, Multiplex’s design managers and the design team at Thorp to oversee the design, manufacture and installation of the facade. A buff water-struck Petersen brick is the key cladding material, offset by white reconstituted stone, glazed terracotta cills and a two-storey mansard. The upper five storeys consist of a series of stepped brick piers and frames over various window openings gathered together to form a vertical order over the facade. The ground and first floor are grouped to form a single base to the building, with brickwork piers rusticated by recessing every fifth course. “The facade sits behind new painted metal railings that match those within the surrounding square,” explains the architect. The new double-height entrance is lined with panels to the side, with walls and floor of stone mosaic, inlaid with brass letters and lit by large brass coloured pendent fittings designed by Tom Dixon. The Leigh Street corner building is expressed as a pair of simple punched brick elevations, with darker water-struck bricks to match the local ‘sooted’ aesthetic. The windows have reconstituted stone surrounds, and the brick sits on a single-storey stone base echoing the 1950s buildings. At the North end of Sandwich Street there is restricted access to a large internal courtyard, where a combination of standard white Portland reconstituted stone panels were installed to the lower two levels and light buff brickwork to the upper levels, all intended to maximise light reflection to the accommodation blocks looking into the courtyard areas. 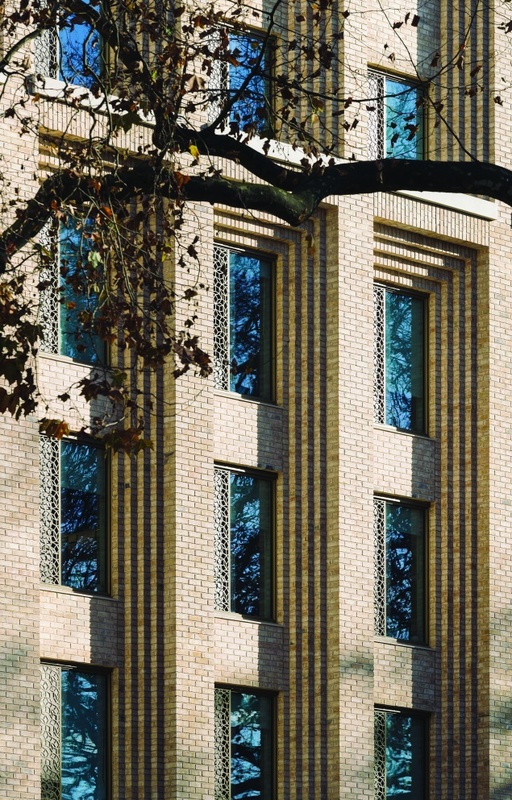 Utilising offsite manufacturing techniques with precisely executed detail, the facade is indistinguishable, apart from some well concealed panel joints, from hand-set brick. The principal rear elevation along Sandwich Street presented a slightly different challenge in that the facade is flatter with a much shallower relief. A large expanse of brickwork, punctuated by regimented window openings, made panel joints harder to conceal. These bricks are characterised by a mix of brindled colours, and had to be carefully placed in the moulds to achieve the desired effect. Casting your eye along the full length of the completed elevation therefore gives the immediate impression of controlled consistency, with the brickwork occasionally broken by slender white concrete window surrounds that are an integral part of the storey-height panels. There are some 1,100 precast panels incorporating four types of brick across the entire scheme. 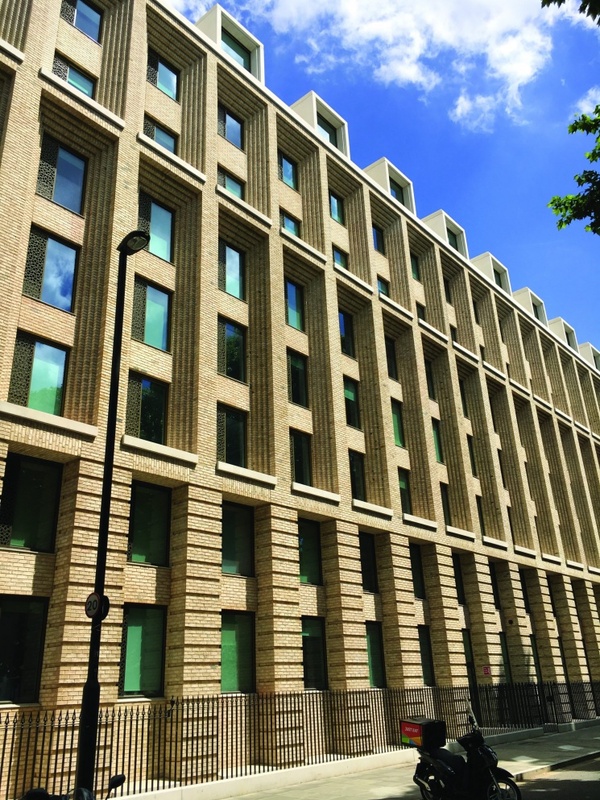 Thorp Precast assumed full responsibility for the scheduling and procurement of all the bricks, preparing them individually, and ensuring they were cast onto precast concrete backing in a way that provided a monolithic look. All the panels were supplied to the site fully finished and factory-pointed on specially adapted trailers. 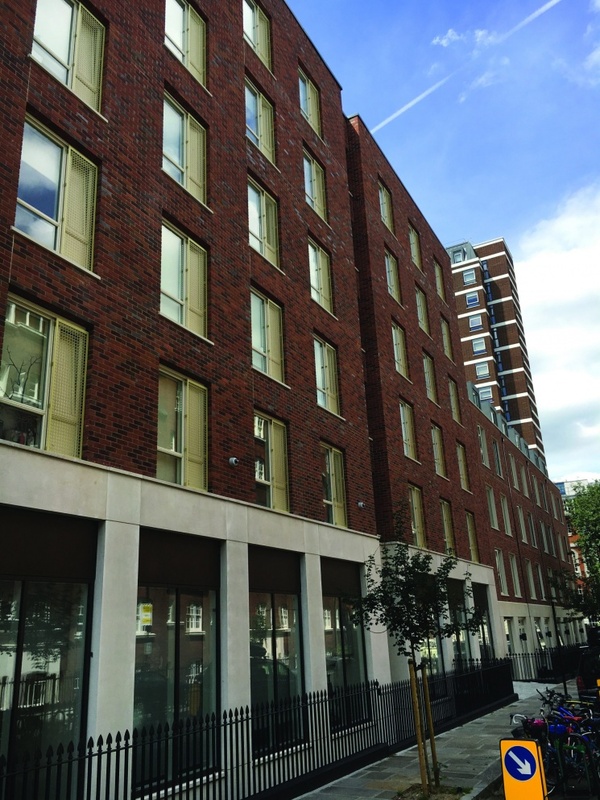 As the facade was initially designed for traditional hand-laid brickwork, one of the key factors in adopting a precast approach was the need to conceal panel joints, while maintaining a nominal 10 mm joint between panels. “What is interesting about the offsite method is how the techniques and refinement of the technology has allowed us to do something quite crafted, such as the steps and the reveals, in what is actually a monolithic way,” says Finnan. Thorp manufactured the vertically emphasised corbelled brickwork mullion units as individual three-storey high units in the form of elongated ‘T’s, weighing 12 tonnes. The corbelled brickwork soffit provided the ideal junction to conceal vertical, slightly stepped 10 mm mastic joints between the T-shaped units. The same exercise was repeated above on levels 5 and 6, but this time reverting to T-shaped units two storeys high. At the top of this elevation are a series of set-back mansard dormers with reconstituted stone wings and white glazed terracotta facings on precast. The corbelled T-shaped units were cast using void formers to reduce weight. Finnan details how the envelope itself was constructed behind the panels: “The brick faced precast elements are ground bearing and sit one on top of another. The panels are restrained back to the concrete frame which provides lateral support to the facade. Despite the wealth of knowledge among the project team, the build presented a variety of challenges, including its sensitive location, which were alleviated by the offsite panelling system. 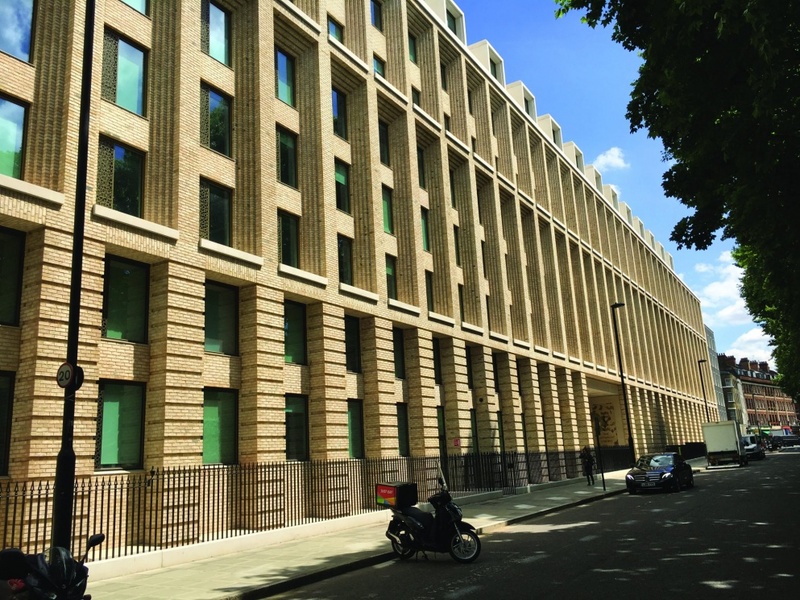 The entire 4,500 m² brick facade facing Cartwright Gardens, as well as many of the other facades, were manufactured offsite as composite precast concrete brick faced panels. This was principally implemented to offer construction programme efficiencies and advantages, including a robust schedule, and guaranteed quality assurance with the panels constructed in factory conditions. In addition there would be a reduction in safety-critical activities with a reduced number of operatives working at height, and a reduced disturbance to neighbouring residents and businesses due to an omission of the perimeter scaffold. 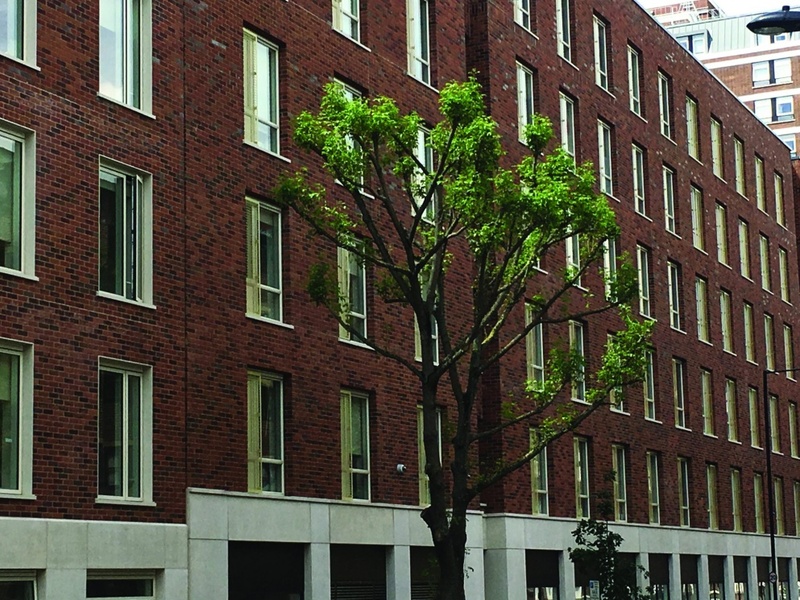 Describing the benefits that the mixed-process offered the scheme, Finnan asserts: “The prefabrication allowed the design team to develop stepped brick details that make reference to the detailing of traditional load bearing masonry. To meet the tight installation schedule, three gangs were used, each with its own tower crane. When it came to finishing work, access was non-existent, so three teams of abseilers were taken on to do the work. Despite the access issues, the project opened on time and the building was soon fully occupied. Starting on site in June 2014, the project reached completion in September 2016. It was later shortlisted for the Brick Development Association’s 2017 Brick Awards, receiving a Highly Commended award in the Worldwide category. The project team achieved a high score under the Considerate Constructors Scheme, and took responsibility for the life cycle of impact materials, sourcing from suppliers with strong environmental credentials, along with the use of offsite construction helping to vastly reduce construction waste. In addition, the project achieved BREEAM Excellent. 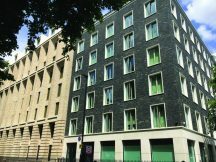 According to commentators, the development has significantly raised the standard of student accommodation in London, demonstrating how well-crafted and innovatively manufactured precast cladding can be used to create some of the most considered building facades in the UK. The reason for the critical acclaim is clear; this redevelopment is a substantial, high quality achievement, with meticulous detailing and richness in form. 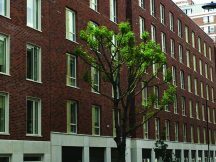 It’s no wonder that, among University of London residences, Garden Halls has seen the largest number of students reapply for the same accommodation.